Alisa Krasnostein blogs daily at girlie jones, where she writes about her life and her passion for speculative fiction, feminism, environmentalism, current affairs and pop culture. 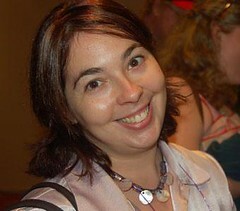 She is the founder of Twelfth Planet Press, an independent specfic publishing house in Australia, convenor for Swancon 2011 (Western Australian Science Fiction Convention) and an environmental engineer in her day life. Last year it concerned me how some members of the online speculative fiction community that I belong to (readers, writers, reviewers, editors and independent press publishers), referred to a particular discussion going on at the time about the representation of female short story writers in science fiction publications as being “the yearly feminist discussion”. Ever since then, I’ve made it a point to regularly blog about the issue and to highlight the issue in the context in which it happens, such as on awards shortlist ballots and years best reading lists, as often as I can. I tag these posts as “breaking through the glass ceiling of sf”. In January I found myself discussing this and other issues relating to feminism with my fellow podcasters on our podcast for ASif! (Australian Specfic in Focus) which was focussing on the work of Justine Larbalestier, including her nonfiction book Battle of the Sexes in Science Fiction. In this discussion we arrived at a discussion point concerning the responsibility of reviewers and commentators. It was raised that another aspect of bias may come from the fact that most commentators, year’s best editors and reviewers of science fiction are men, and recommend stories according to their own tastes or levels of engagement. So I read with great interest for style and tone a recent review on the online review blog Horrorscope, discussing the current issue of Aurealis magazine, which features an all female table of contents. The initial published review was badly written and full of typos and spelling mistakes. In addition, I found this review to be somewhat patronising towards the female writers in question, and indeed female writers at large, and blogged a post to lead a discussion on this, “Is that the glass ceiling?”. There is always much discussion about the choice to go with an all female lineup for a magazine. Noteworthy is the fact that there is often much less discussion when the choice is the reverse. “AUREALIS #41 showcases the talents of Australia’s female speculative fiction writers with an all girl’s issue of the premier fantasy, horror and sci-fi mag. Tell me, is it me? Soon after my blog post, the review was edited somewhat by the Managing Editor. However, the original review appears in part and in full in various places on my blog post. Overall, this discussion was very interesting and telling. Perhaps two issues were best revealed through the ongoing discussion. And I discussed these in a follow up post, “Response”. It’s implied that the appearance in the comments to my blog post by the reviewer, and his apology, cleared the matter up. While this is of course appreciated, and it was acknowledged as such, this does not negate the discussion. The discussion is not actually changed by the intent of the reviewer. No, he didn’t mean to come across that way, but that doesn’t mean the piece didn’t offend. Secondly the discussion revealed how women in the Australian-specfic community feel. What I thought most interesting was when the reviewer came in to clarify elements of his review and indicated that his use of “usual contenders” was meant for the usual female writers, but women interpreted that to mean “other than women”. Whether or not that is what he meant, what is interesting is this assumption reveals how women in our community and in SF generally feel. And that was, to me, the most productive outcome of this discussion. Because unless we deal with the undercurrents of feeling biased against, the science fiction community is probably not yet ready to move forward into an era without prejudice. Buried in the comments thread is a discussion on why or how the percentage of women in a table of contents for a science fiction publication is around 23%. Its a discussion we’ve had at length elsewhere, on my blog and others, but Tansy Rayner Roberts provided a good recap in reference to this here: “Feminism and Some, uh, Other… Stuff“. yep, they’re organic and everything, and more importantly they are ours. Yes, the “our girls” things sets my teeth on edge, too. I’m finding it hard to think of any explanation to the “alternate view” other than “Hey, they’re chicks, they think differently from regular people!” Are Hoydenizens finding other readings? The fact that this is ever referred to as the “yearly feminist discussion” is belittling and indicative of the privilege these blokes are lugging around. They only have to deal with it – well, hardly deal with it, just have their delicate sensibilities briefly offended by it – once a year. We live it every single day, it’s not a passing hobby; it’s not something we can put aside and say “well, we’ll pretend to deal with that again next year”. Hmm. The “alternate view” thing… I can’t tell if I’m splitting hairs, but my take is: yeah, probably what women writers write is different from what men writers write, though I don’t think this is predictable, or necessary, or anything. And given that men writers seem to dominate most of the time, not just in terms of numbers but more importantly in being treated as central and standard, it’s not surprising that their ‘view’ is the default centre, whilst women’s is deemed ‘alternate’. So I on the one hand might kinda see that claim as accurate, but without a discussion of the politics that goes into making it so, it’s just reinforcing the problem. Wacky grrls and their alternativeness!! * Yes, my friends, that would be a reduction and a generalisation. Which is generally what happens with commentary on women’s writing.